These are rice krispie treats… with a twist. Browning the butter gives these treats a different flavor – they become more rich, filled with nutty undertones, and infinitely more delicious. 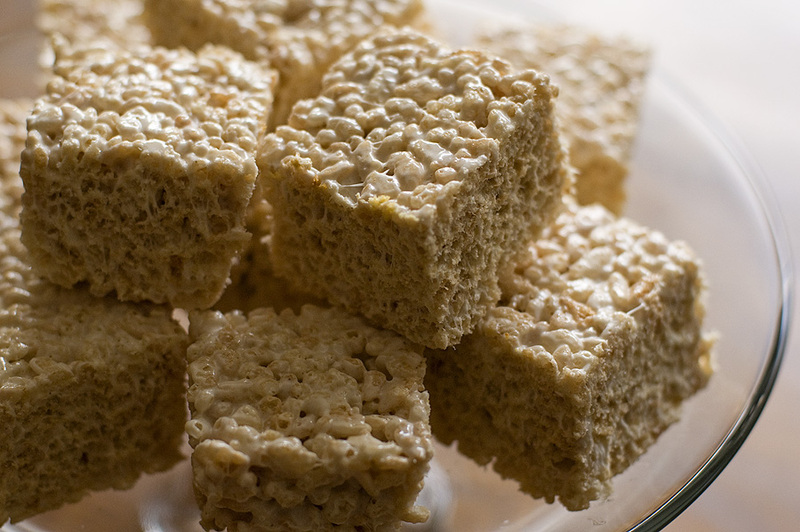 They are just as easy to make as regular rice krispie treats, so give them a try. 1. Butter (or coat with non-stick spray) an 8-inch square cake pan with 2-inch sides. 2. In a large pot, melt butter over medium-low heat. It will melt, then foam, then turn clear golden and finally start to turn brown and smell nutty. Stir frequently, scraping up any bits from the bottom as you do. Don’t take your eyes off the pot as while you may be impatient for it to start browning, the period between the time the butter begins to take on color and the point where it burns is often less than a minute. 3. As soon as the butter takes on a nutty color, turn the heat off and stir in the marshmallows. 4. Remove the pot from the stove and stir in the cereal. Quickly spread into prepared pan. Let cool & cut into squares.